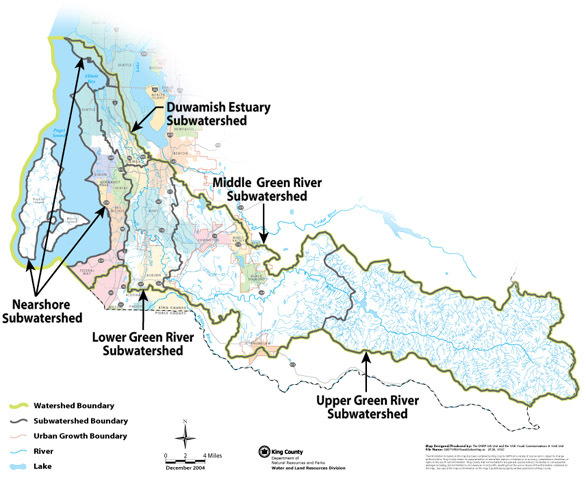 We divide the Green/Duwamish and Central Puget Sound Watershed into parts we call subwatersheds to better analyze the needs of salmon and design specific protection and restoration efforts to meet those needs. Click on the map below to find out what people are doing to protect and restore salmon habitat in the subwatershed where you live or work. Need to enlarge the map? Download a version of the map showing more detail (Adobe Acrobat 912 KB). Also available is a land use map, which shows all watersheds in King County. Some projects that are watershed-wide priorities have received funding from the State Salmon Recovery Funding Board. Learn more about these projects and view maps, photos, and brief descriptions of all of the watershed projects that have been funded by the Salmon Recovery Funding Board. There are many private citizens, non-profit groups, businesses, state agencies, tribes, and federal agencies working to protect and restore salmon habitat in this watershed. You can learn more about these partners by clicking on the subwatersheds in the map above. In addition, the 16 local governments of the watershed play a key role in salmon habitat recovery due to their responsibilities for land use planning, transportation, parks, and stormwater management. In addition, all the local governments contribute funding to support watershed salmon habitat recovery. This funding supports both a small staff and projects and programs. These local governments also work closely with the King Conservation District, which plays a key role in natural resource conservation through non-regulatory assistance provided directly to landowners and through funding of high priority watershed habitat projects.